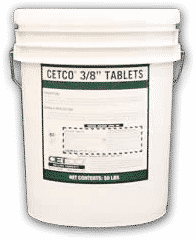 Cetco® Tablets are organic free, high-swelling pure sodium bentonite compressed into 1/4″, 3/8″ and 1/2″ diameters tablets. Cetco® Tablets isolate screened intervals of monitoring wells and provide an excellent seal for abandoned boreholes. The 1/4″ tablets are ideal for tight annular spaces, while the 3/8″ and 1/2″ tablets are useful for larger boreholes. Cetco® Tablets are certified to NSF/ANSI Standard 60, Drinking Water Treatment Chemicals – Health Effects.